How to Engage in ERP by focusing on your strengths | Blog It Back! It’s true, ERP is not for the faint of heart. Committing to ERP requires a willingness to experience emotional pain. I’m not saying the pain will definitely occur. To one’s surprise, sometimes it doesn’t—the anticipation of confronting a fear can be worse than facing it! In comparison, avoidance causes more pain than confronting. But, if facing a fear does cause discomfort, it’s usually short-lived. 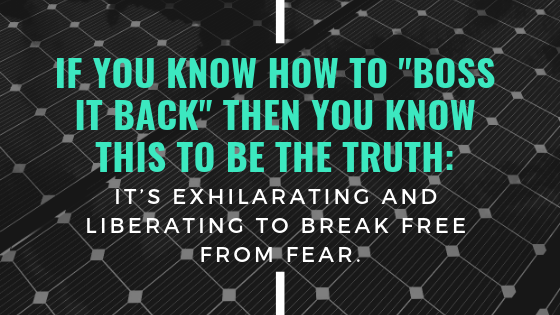 When I give advice to face a fear, a client almost always says, “easier said than done.” Listen, I know it’s scary to give up trying to prevent bad things from happening. 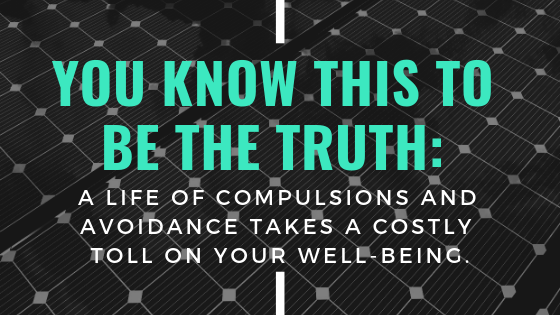 But, you’ve got your head in the sand if you think it’s easier to live a life of compulsions! No matter what you do (Feed OCD or Boss it Back), it ain’t going to be easy! No matter what you do, it’s going to be hard. But you have strengths to help you face any challenge. By tapping into your strengths you will feel stronger and more daring. 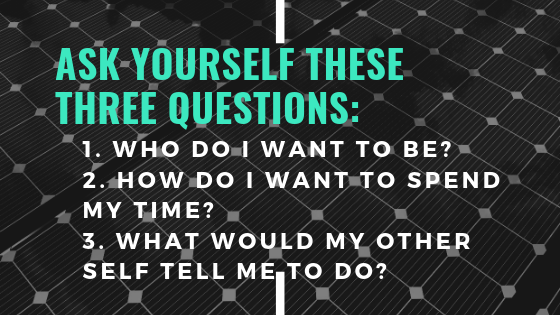 After you answer those questions you’ll hopefully make the right choice and boss it back through Exposure & Response Prevention (ERP). Once you take the plunge and immerse yourself in ERP, the reward of freedom and independence is well-worth the hard work of saying “no” to OCD. Besides, most people admit that feeding OCD only turns fear into terror, and pain into long-lasting agony. It’s best to confront and not avoid; accept uncertainty, and not seek reassurance. BE DARING. You’re stronger than you think. You can endure the difficult times. You can defy OCD. The credit belongs to the one who is actually in the arena, whose face is marred by dust and sweat and blood; who strived valiantly; who errs, who comes again and again, because there is no effort without error and shortcoming; but who does actually strive to do the deeds; who knows great enthusiasms, the great devotions; who spends himself in a worthy cause; who at the best knows in the end the triumph of high achievement, and who at the worst, if he fails, at least fails while daring greatly. What’s interesting about this quote is that Teddy Roosevelt is bringing into focus the need to emphasize strengths, not shortcomings. He displays a growth mindset and highlights the importance of being daring. Daring people believe everything will be okay in the end, and if it’s not okay, it’s not the end. If there’s one thing I’ve learned about people with OCD, it’s this: being daring is your superpower. But, I’ve also noticed that your superpower vanishes quickly when you get down on yourself. Every person is unique and has the potential to change. You can live well with OCD. The key is to capitalize on your strengths and pay no mind to your shortcomings. You reinforce your shortcomings by focusing on them! The secret to being daring is to focus on your strengths, not weaknesses or deficits. Imagine what is possible when you take advantage of your strengths! 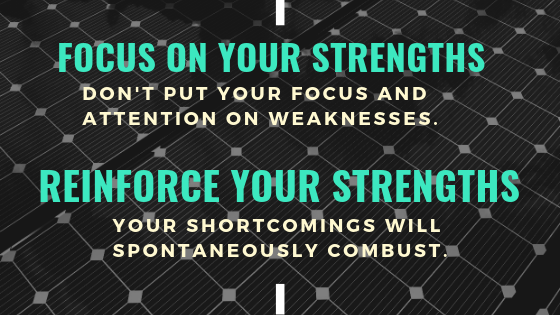 Did you know that by focusing on your strengths your shortcomings will spontaneously combust? Focus your efforts on developing your strengths and the rest will take care of itself. 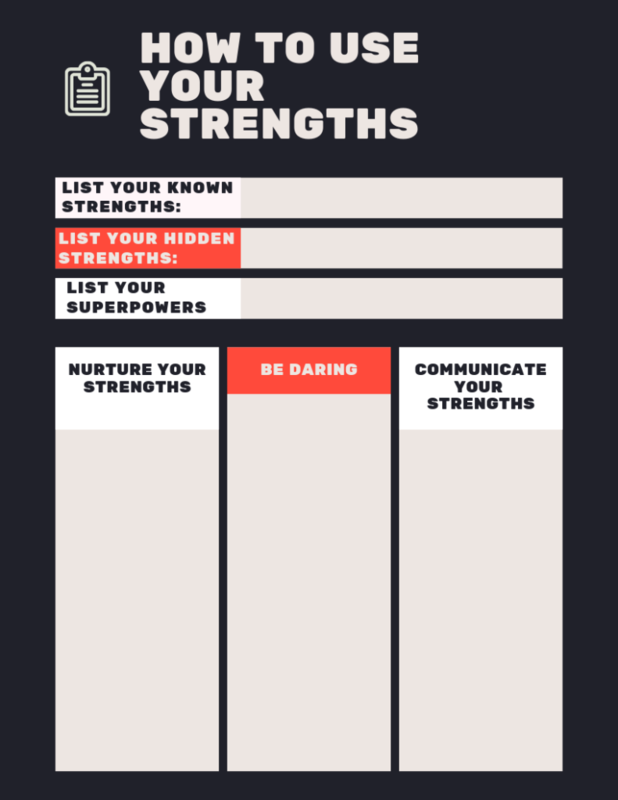 Here’s an interesting article about focusing on strengths: What are your strengths and why you should list them. You’re an over thinker and this is a shortcoming. But it’s not a good idea to try and improve by thinking less. We know where that takes you. Trying not to think makes you think more! But perhaps one of your strengths is that you are known for your high level of energy. Focus on your strength of being more action-oriented, and you won’t have time to overthink. Spend your time nurturing your strengths and not your shortcomings. This will make you more daring. Focusing on your weaknesses makes it harder to confront fear because your shortcomings make you feel weak. Whereas, developing and improving upon your strengths increases brain activity, releases happy juices (serotonin/dopamine) and makes you feel strong. At the moment, I’m feeling like a victim. I’m having bad thoughts one right after the other. This is depressing. I thought I was done having intrusive thoughts. I feel like I’m being attacked from all sides. My family refuses to acknowledge how hard my life is. Yes, I have a victim mentality, but I don’t think I always have this. I’m trying really hard, and no one is giving me any credit. Having OCD is frustrating. What’s interesting about this person is that s/he is focused on the problem, not the solution. There is no mention of this person’s strengths. We are not responsible for being down but we are responsible for getting up. When an exposure exercise starts to get easy ask, “How can I be even more daring?” Dare to feel uncomfortable and life changes. Your strengths can help you be more daring. Imagine being 60+ years old. What would you tell your younger self to focus on? Would you tell your younger self to self-loathe and hopelessly concentrate on weaknesses? What if you could be someone else for 30 minutes. What would your other self be like? Recalling one of your own strategies from a past success of risk-taking, what advice would you give to a friend who doesn’t feel very daring. What personality traits help you to keep going even when times are hard? Think about something you’re good at. Now, ask yourself, “why?” Why are you good at it? Next ask if you can get even better at it. How? There is a $15 fee but the results are worth it. Just make sure you rate yourself fairly. No self-loathing allowed! Use plenty of positive adjectives. Be comprehensive. The more adjectives you use, the better your report will be. Use this free code (YOU-bossitback) to discover what’s fascinating about you. (This code can only be used a limited number of times—so 1st come 1st serve!) Go to HowToFascinate.com/YOU Enter the code (YOU-bossitback) + your information. Click the “Start Now” button. 3. This is a more costly assessment but highly informative and popular. Once you have identified some of your strengths, it’s time to take advantage of them! Always, always, always pat yourself on the back for initiative and effort regardless of the outcome. Better to take risks than be paralyzed. We all have strengths we don’t even know exist. We use them every day but we haven’t identified them because they run in the background of our consciousness. Taking one of the online assessments can be helpful with finding hidden strengths, but asking friends and family is often even more enlightening. It’s beneficial to have a visible way to keep track of your progress. Download an app (e.g. habitbull) on your phone or keep a diary. I like apps because they provide graphs which are rewarding to look at and see the progress. Maybe someone else isn’t as organized and as good at planning as you. Offer your services. Design a planner and sell it on Amazon. Instead of reading a self-help book to improve upon a weakness, read a self-help book or listen to a podcast or Ted Talk about one of your strengths. Reinforce your strengths by learning more about them. Use your strengths to be daring. Dare to be uncomfortable and you’ll leave OCD crippled by your superpower. By sharpening your skills and reinforcing your strengths, you’ll be more motivated to engage in ERP. I loved this post. It is a great reminder and highlights a lot of the strategies that I’ve learned from you that I need to remember to keep fresh. Sometimes OCD tricks us that it is easier to focus on our weaknesses when it feels like the doubt takes over. Waking up and setting a goal based on my strengths has been helping me. You represent wisdom, loving kindness and you have true grit. I hope you wake up and count those as your strengths along with many others!